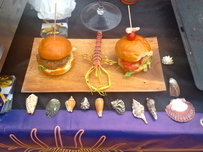 Saturday 17th May was the first Feast in the Fields food festival of the year. 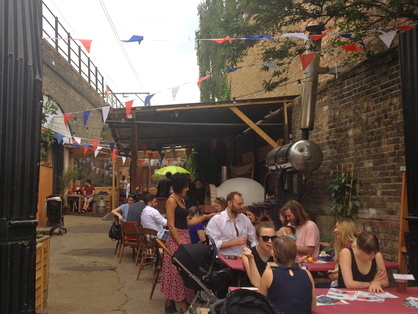 Held at London Fields Brewery, the weekly event brings together local London purveyors of world food. Inside The Brewhouse, based in the centre of Hackney under the railway arches next to the oasis of greenery within the smoke that is London Fields itself, were the array of in-house beers such as Hoxton Hipster (a Pacific pale ale) and Shoreditch Triangle IPA, that are putting Hackney on the map as a destination for great beer. 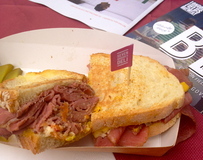 We ate courtesy of 7 Bridges Deli, a Brixton-based duo producing New York-style pastrami. Smoked using a variety of flavour-giving woods, their six-stage stack using cherry smoked pastrami with your choice of bread, dressing, cheese and sides satisfied both hunger and palette. We also tried the delicious Mexican shrimp burgers from the Pan-Latin American streetfood stall Tacu-Tacu. The flyer promised “Handcrafted in Hackney” and didn’t disappoint. 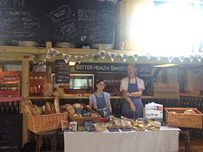 Better Health Bakery, based in Haggerston, sold a wide range of delicious sourdough breads and sweet treats. Growing Communities is a social enterprise run by locals in east London and provide an organic vegetable box scheme. Old Spitalfields Market based Square Pie came with a selection of bite-size “canapies” in such tasty flavours as chili beef and Spinach, and sweet potato and goats cheese. The day had gotten off to a cloudy start, but once the sun finally broke through, we were grateful of Lickalix natural handmade ice-lollies to cool us down. With a varied bill of DJs and bands playing live music, and a chilled village fete vibe, this is a great way to spend a Saturday for Hoxton hipsters, dog owners and families alike. Feast in the Fields runs every Saturday May – July.